With wedding bells just round the corner, every bride-to-be begins the hunt for her dream lehenga. Make no mistake, she has been planning this one outfit, whether secretly or otherwise, for a long, long time. But often what happens is that when the moment of choice finally arrives, it is somewhat anticlimactic. She is overwhelmed at the vast plethora of fabrics, cuts and colours she needs to choose between. 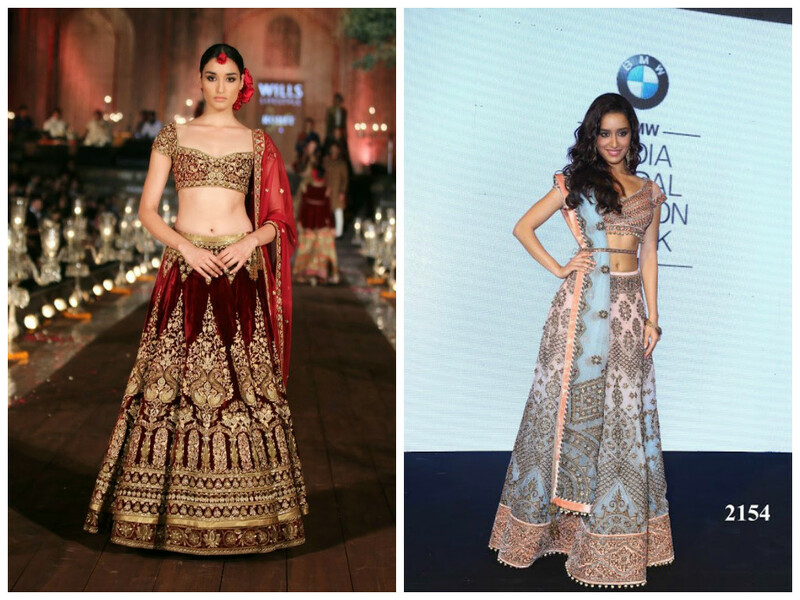 If you are facing a similar situation – looking for the perfect wedding outfit and just so confused – this might help: the who’s who of fashion have decided what will make you the beautiful blushing bride and here are the lehenga styles trending high in 2015. 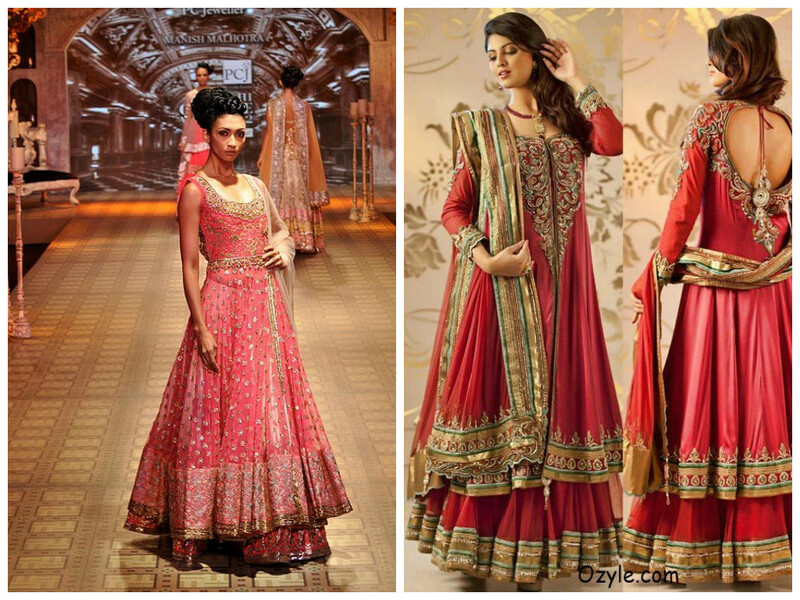 The classic lehenga style – with a pleated, flared, voluminous skirt – ghagaras never go out of fashion. They remain popular in 2015 too. Cinched at the waist, often with elaborate detailing there matching the skirt border – these appear graceful on every body type. Go in for a traditional ghagara if you want to look like the quintessential Indian bride. 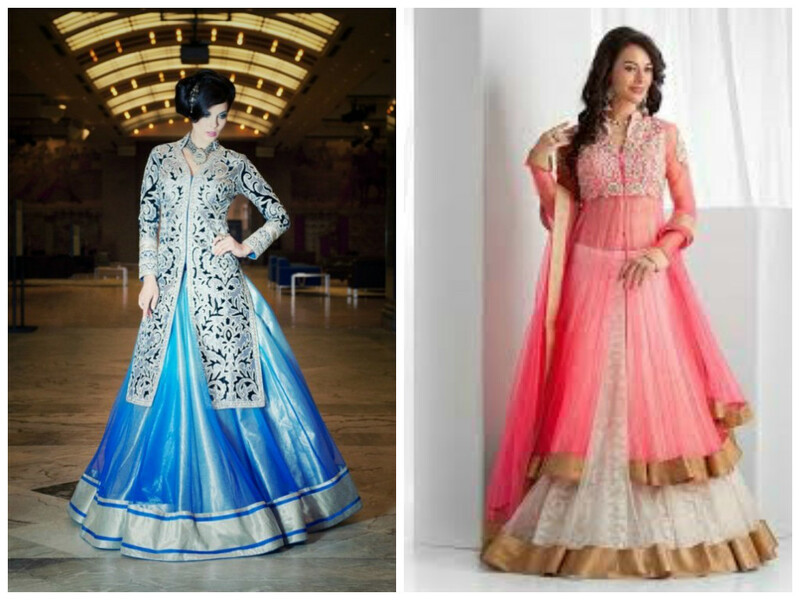 These comprise of a lehenga bottom and choli, topped with a long jacket with either heavy work or a netted bodice. 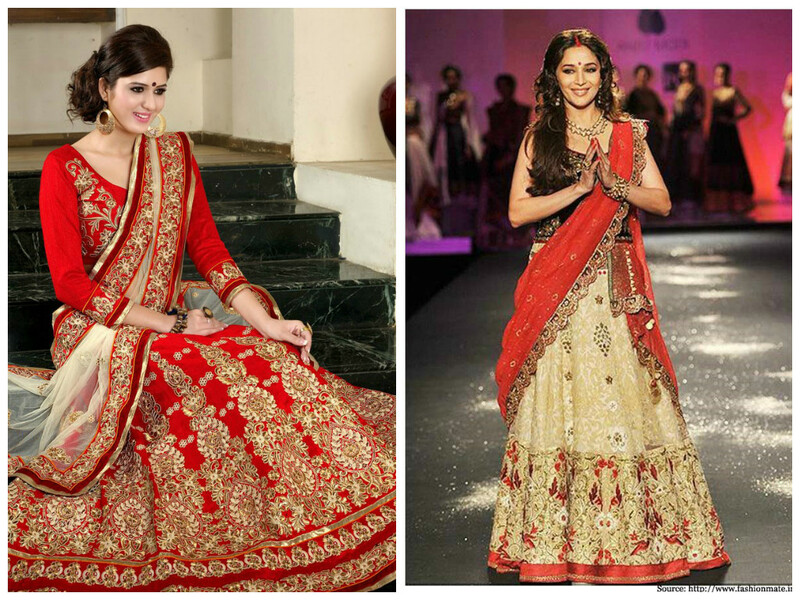 Spotted often in Manish Malhotra’s collections, these jacketed lehengas look regal and runway ready. For those who are heavily into high couture, these would be a good option. Lehengas on silky material with ample work in gold and ivory tones are also appearing recurrently in bridal fashion. They offer a rich, feminine look, which is great for brides-to-be who are more conventional in their tastes. 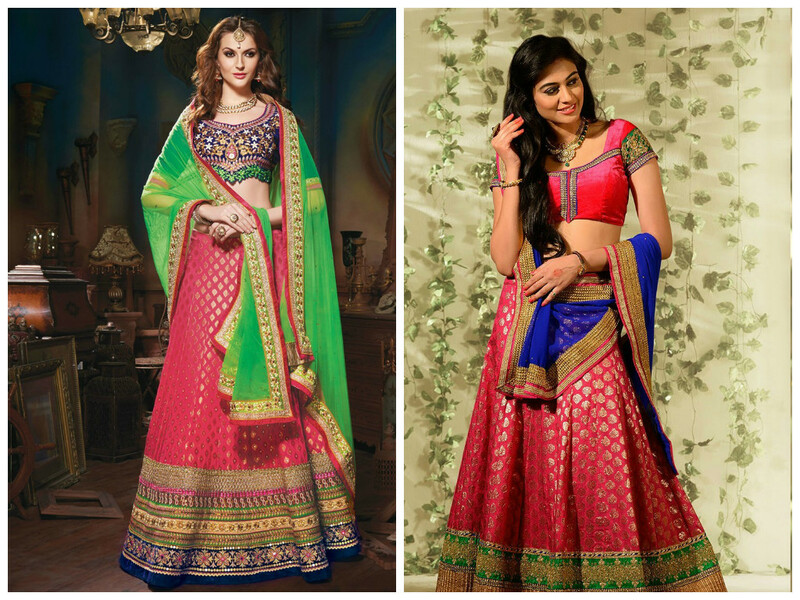 Both these styles represent a fusion of different forms of traditional Indian clothing. Anarkali lehengas have an almost floor-length anarkali-cut top, covering a flared skirt at the bottom. Lehenga gowns are typically floor-length gowns fashioned with ethnic cuts and embroidery to mimic the look of classic lehenga. 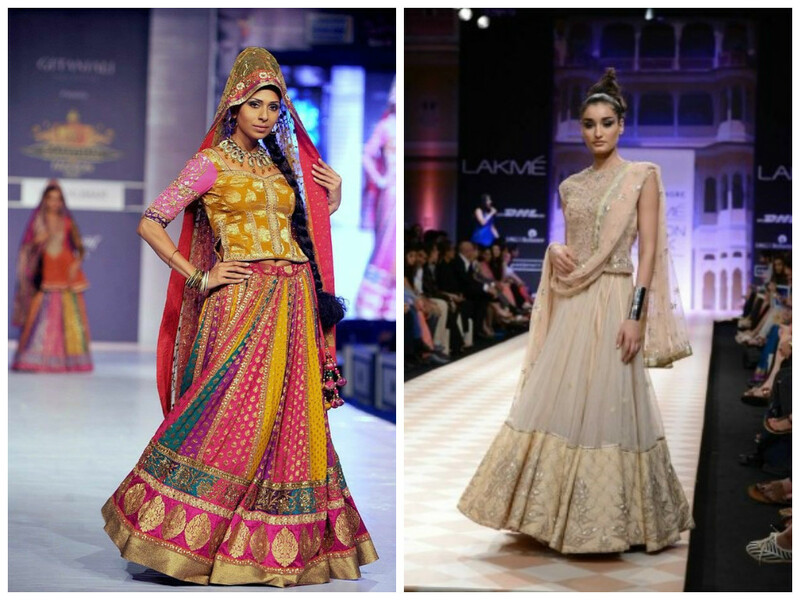 Both these styles would suit the modern Indian bride who is confident in her unconventional, experimental tastes. 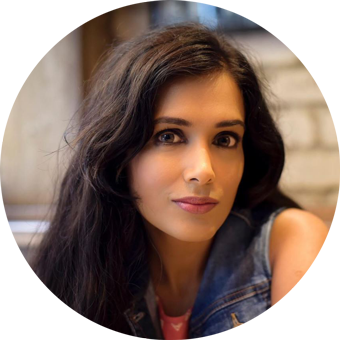 Another fusion of two distinct forms of Indian ethnic-wear, the lehenga sari is essentially a three piece garment – the choli is separate while the legenga-bottom wraps around the waist and the dupatta is draped like a pallu. The lehenga sari looks like a sari, sans the pleats. Overall, it creates an elegant and deceptively simple feel – perfect for the minimalist bride. In this type of lehenga, the skirt retains a somewhat conical shape, forming an ‘A’. This is a clean cut which is best for thick materials and heavy embroideries. Thus, velvet lehengas or full-length zardozi panels are made with the A-line silhouette; naturally, these never go out of fashion either. They are most suitable for the bride of fine tastes, who wants to have a most fancy, elaborate lehenga.